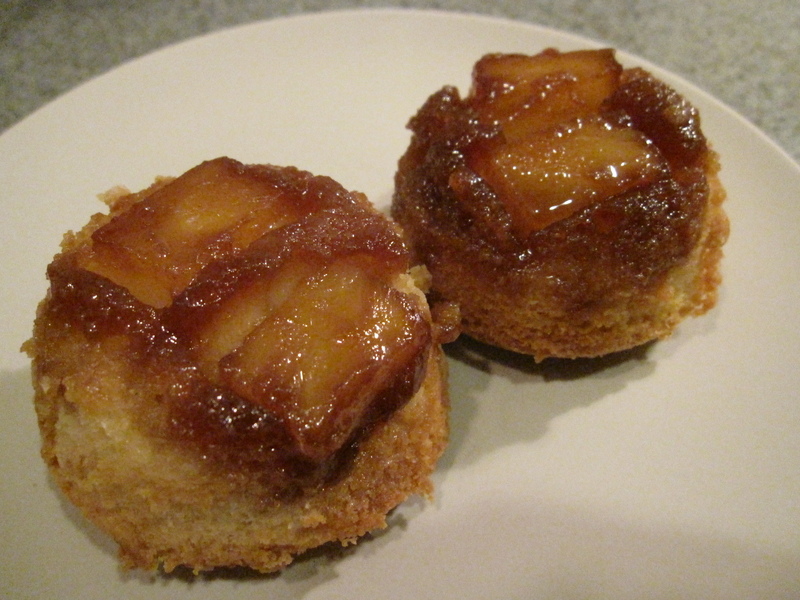 I made mini pineapple upside down cakes in a cupcake pan. I like turning full cakes into cupcakes, since they are fun to give out, it’s a perfect portion, and really cute. Well making a pineapple upside down cake into cupcake pan is really easy. So make them and you will happily enjoy some cake, as well as easily share with a friend. I have this thing for pineapple. Love it. I put pineapple on my pizza. Love pineapple in fried rice. I always cook pineapple chunks with baby carrots. ( I learned it from my aunt and have done it like that since). Sliced pineapple is pure tart, sugary joy. Pineapple juice is great to start a mixed drink. My only beef with pineapple is how if I consume too much I quickly get canker sores. Damn you! Well, one of the standards is pineapple upside down cake; which I have never had before. How you ask? No idea but I decided I would need to have it before National Pineapple Upside Down Cake (today-April 20th) to understand the fuss. I now get it. Pineapple upside down cake is moist, sweet, sugary, and delightfully sticky. Sure you can avoid the stickiness of eating the cupcake by using a fork but then you don’t get to lick the carmely brown sugar from your fingers. Now the standard is making this in 1 pan so you might be wondering about getting these cupcakes out. Well, don’t freight about getting them out of their cups- not really different than the standard cake. Instead of putting a plate on top of your pan and then flipping it, you use a cutting board and in 1 swift move flip it over. Ta-da, done. Don’t wimp out now. Give it a try and you will be happy you did. I used the pineapple upside down cake recipe from Ree Dummond’s cookbook The Pioneer Woman Cooks. Since getting this cookbook there have been quite a few nights sitting on the sofa while I flip through it and think how great it would be to make buttermilk biscuits, sunriser eggs, meatloaf, etc but I have finally made the jump and made her pineapple upside down cake. I divided the recipe in half to make the cupcakes, which perfectly equaled 12 cupcake, plus a tiny bit of extra batter to lick off the spoon. The only reason I made half the recipe is because I only had 1 egg in the house and I did not feel like going out for more eggs- ha! So feel free to make 24 cupcakes by doubling the recipe below. Ree has such a great book full of mouth-watering recipes. Can’t wait to try another thing in there. To make the batter, cream the 2 tablespoon portion of butter and shortening with the granulated sugar. Once they have been combined add the eggs and vanilla. Alternate the addition of the flour with the milk. Mix until all are gently combined. 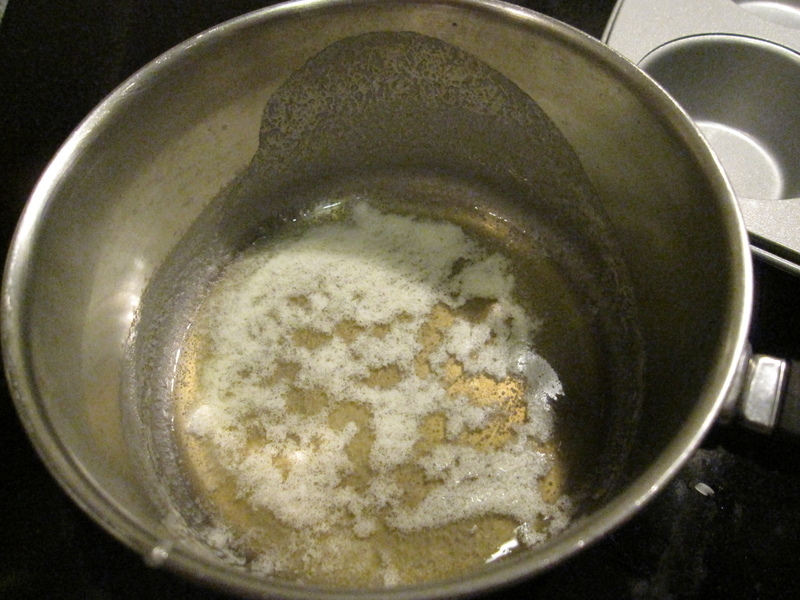 In a small pan melt the remaining 4 tablespoons of butter. 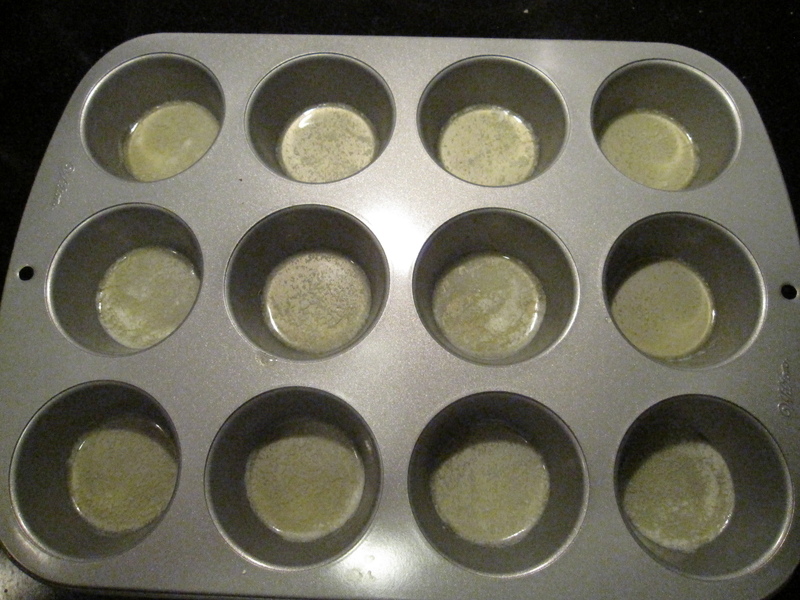 Once the butter has melted divided it into the 12 nonstick cupcake cups. Add a heaping tablespoon of brown sugar to each cupcake cup. 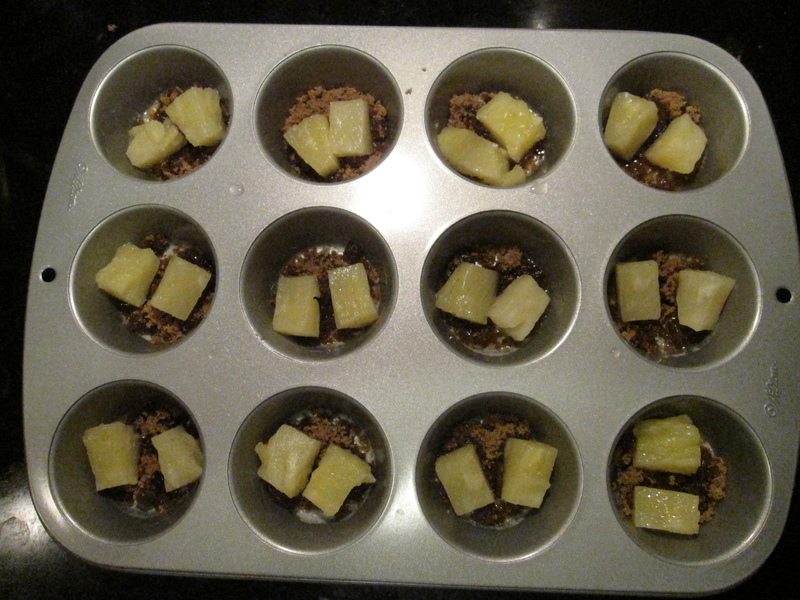 Add 2 pieces of pineapple* and cheery half (optional) to each cup. 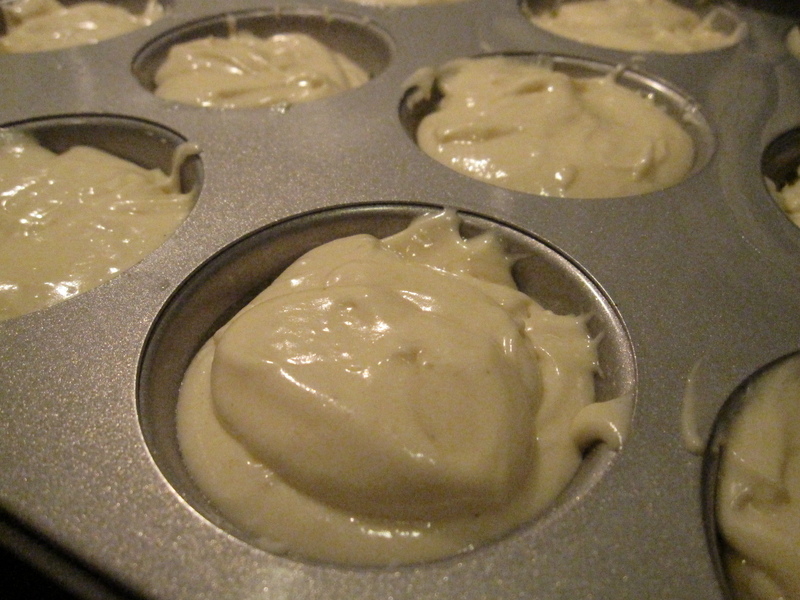 Divide the batter evenly, fill each cup just under the top of the edge. These don’t rise much but don’t do over the edge since they will rise a bit and make removal difficult. Bake for 25 minutes, or until your toothpick is inserted and is removed clean. Run a knife around each cupcake to allow for easy removal. Take a cutting board and place over the cupcake pan. In one swift motion flip the pan over to invert the pan for cupcake release. The cupcake generally invert easily, if you have any problems gently tap the tin for release. It is best to serve these warm, but don’t rush it and burn your mouth!! If you happen to prefer, or have it and don’t feel like going to the store for anything else, crushed pineapple over chunks then use a bit of that. Just do what makes you happy. I love this idea! I am planning to make pineapple upside down pancakes this weekend! In a pineapple mood with this hot, tropical weather going on today in SoCal.